State Regulations mandate that City Utilities and Water Districts throughout Colorado must protect their water distribution systems from possible contamination by identifying water users that pose a potential risk to drinking water quality. 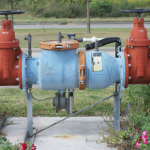 The Water Supplier will require the proper backflow prevention assembly to be installed and maintained by the owner. We are fully insured with REAL General Liability and workman’s compensation Insurance. Our Technicians are the best trained in the industry. We offer Low Cost, Quality Testing with NO hidden charges. We will perform the test as quickly as possible and get your water back on with minimal inconvenience. We stock the most common repair kits. Our technicians carry these parts on their trucks so most repairs can be done same day with your approval. We take care of submitting all the paperwork to the water districts…no hassles or extra cost for you. Site water hazard surveys are required to determine if the ways water is used creates a potential threat to the drinking water quality. This threat could be to the city drinking water in which case the water district will require the installation of a backflow prevention assembly on the main water service to comply with the water district cross connection control program. The system within the building plumbing system that causes the hazard is also required to have backflow prevention protection to comply with local plumbing codes. Backflow Consulting will survey your site to help determine what is needed. We will serve as a liaison between you and the Water District. We can save you money through our knowledge of the industry.